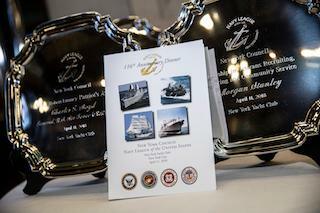 New York Council, Navy League of the United States, Inc. - 116th-Anniversary-Dinner New York Council, Navy League of the United States, Inc.
An extraordinary group of 200 leaders from the private, public and military sectors convened at the illustrious New York Yacht Club in New York City on April 11th to celebrate the 116th Anniversary of the Navy League. 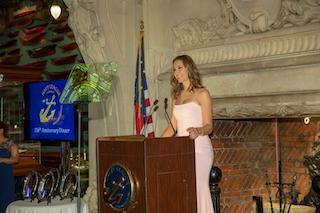 The annual gala is the opportunity for New York Council members, supporters and friends to raise funds that are vitally important to the Council’s support of Fleet Week New York, the U.S. Naval War College and the Navy League’s mission to support the men and women who honorably serve in the U.S. Navy, Marine Corps, Coast Guard and Merchant Marine. Proceeds from the evening also benefit 1,000 New York City area high school students who are members of the Council’s six youth educational programs, which include the Young Marines, Naval Sea Cadet Corps, Marine Corps Junior ROTC and three Navy Junior ROTC units. The Council honored three distinguished Americans and a financial firm. 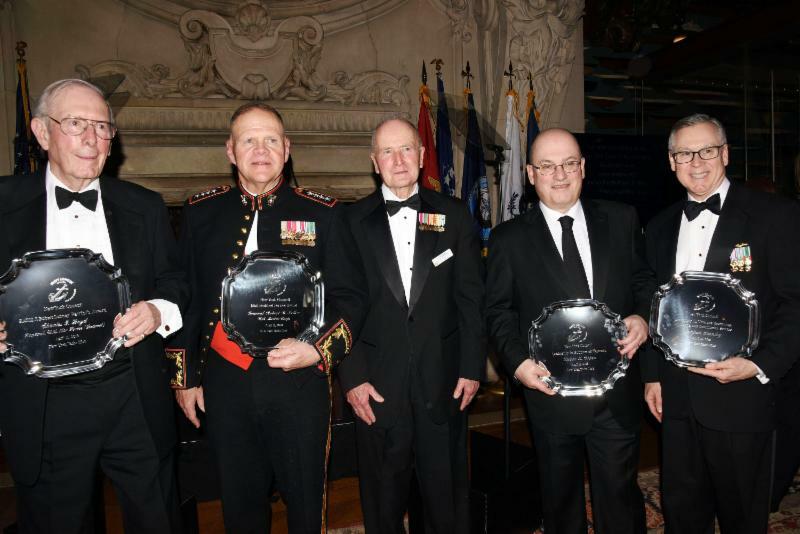 General Robert B. Neller, USMC, Commandant of the United States Marine Corps, received the Council’s Distinguished Service Award; General Charles G. Boyd, USAF (Ret.) received the RADM J. Robert Lunney Patriot’s Award; Steven A. Cohen, Founder of Cohen Veterans Network and Cohen Veterans Bioscience, received the Leadership in Support of Veterans Award; and Morgan Stanley received the Leadership in Veterans Recruiting, Mentoring and Community Service. Joe Purcell, Managing Director of Investment Banking and Co-Chair of the Veteran’s Network, accepted the award for Morgan Stanley. Award plaques were then presented to each of the honorees by Council President Blaich. Staff Sergeant Ashley Arnone, representing the Tottenville High School MCJROTC unit and Gunnery Sergeant Mark Rigano, a Young Marine, assisted Blaich in the award presentation to the honorees. SSgt Arnone was nominated by her school to be a candidate for the American Legion’s Empire Girls State program. GySgt Rigano received a round of applause for being accepted to the U.S. Naval Academy at Annapolis as a cadet in the Marine Option program. Dinner Co-Chairmen were Council Vice Presidents Ted Mason and Richard Heller. Honorary Dinner Chairs were Dayton T. Carr, President, VCFA Group; Maurice (Hank) Greenberg, Chairman & CEO, C.V. Starr & Co.; Colonel Jack Jacobs, USA (Ret. ), Congressional Medal of Honor recipient; and Doris Scheuing, whose late husband Richard Scheuing, assisted in founding Fleet Week New York. Area officers, senior enlisted personnel and one cadet from each of the Council’s six adopted sea service units were specially selected to attend without charge due to the generous contributions from sponsors of the event. The cadets also welcomed guests and escorted them throughout the clubhouse. In his keynote remarks, Gen. Neller offered an update on where Marine and Navy forces are deployed across the globe, as well as some comforting words on the quality of the force. "They are operating on land, on sea, under the sea, and in the air. I think we are in a good place. They are well trained and well led. We know what we have to do. I don't worry about the mission getting done. Because if you knew what I know...how many [Marines and Sailors] are out there right now in the dark of the night taking care of those who would like to come here and do us harm...just sleep well. We go it."